I read. Often. I also write. I also have a vague notion of eventually calling myself a published author. Mind you, there are a lot of obstacles in my way. One of them is literacy — as in lack thereof. Unsurprisingly, there’s a relationship between the number of people who are literate and the number of people who read books. I came across a sad video. Here’s the thing with the second video. I doubt many people will watch it. It’s 17 minutes. It’s funny, it’s informative, it’s depressing, but none of that matters . . . it’s 17 minutes long. Way, way, way longer than most people’s attention span. Let me then summarize some of the points it covers. I will use a few slides that are screen captures from the actual video. If the Owner (TEDx or the presenter, Alexander Macris) wish me to remove them, let me know. Ain’t disclaimers wonderful? I mean, there’s no way either of them will read this piece. But if they do, I would like to ask them if the transcript of the presentation is available. Macris then looks at reading statistics spanning 300 years — 1710 to 2010 — of best-sellers, and this is where it starts to get depressing. There’s a small piece of information that he doesn’t cover, so I looked it up. My thinking was that surely the literacy rate in colonial America was not that high. In fact, the few sources I read put the literacy rate at between 70% and 100%. That, by the way, is where it stands today (14% of US population is illiterate — that’s 32 million people). Meaning, the statistics spanning the 300 years can be compared. So, let’s compare them. Best selling books, what people were reading then and what they are reading now. Sentence length has been declining steadily . . . from an average of 40 words per sentence in 1710 to an average of 14 words per sentence in 2010. In the 1700s the average reading grade of best sellers was 14.5 while the average reading grade of best sellers in 2010 was 4.5. 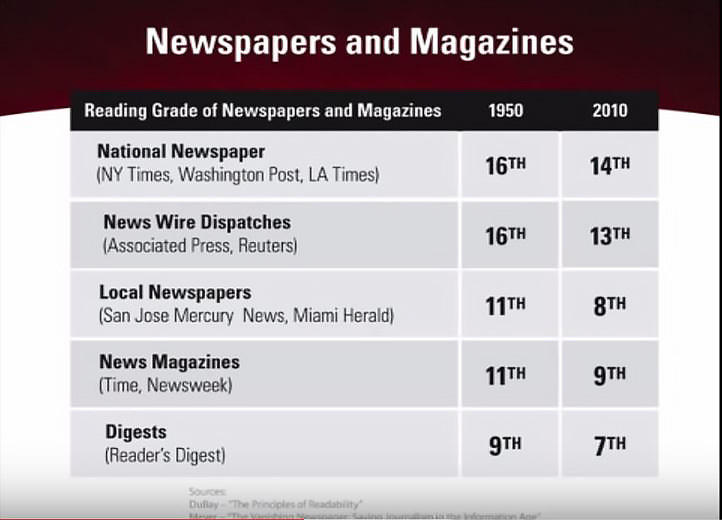 Is there any surprise that the majority of Americans get their news and information from Television and the Internet? Most of them can’t read the damn newspapers, and even if they do, they’re not likely to understand or retain what they read. Here’s a chart illustrating that fact . . . 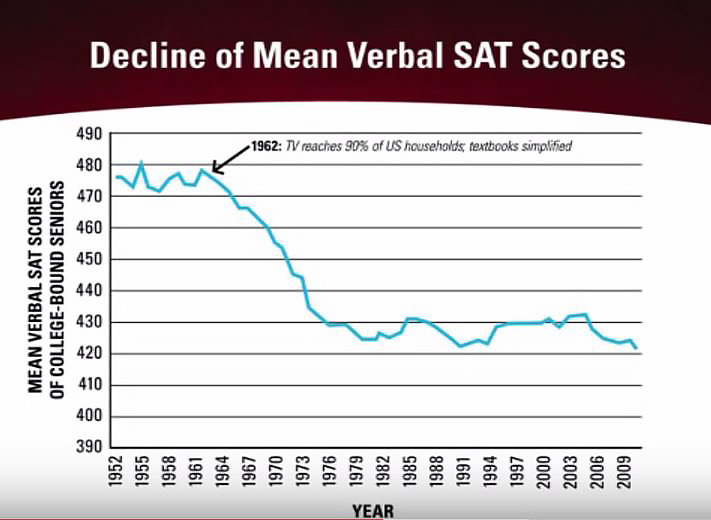 In 2003, only 20% of the population read at the equivalent of a 10th-grade level. 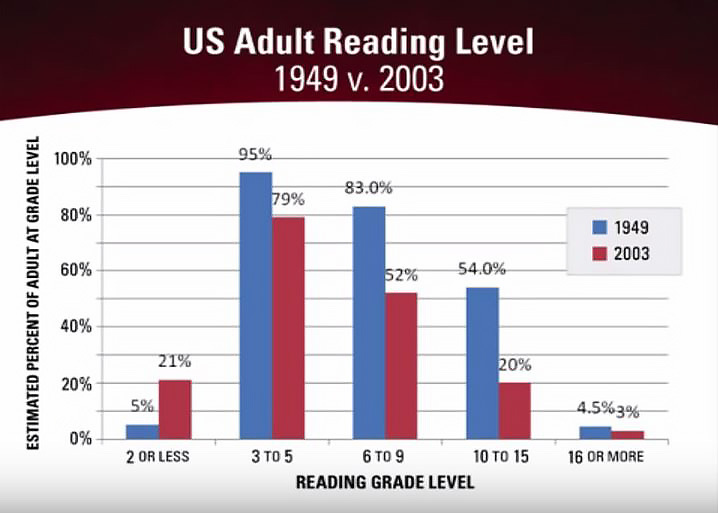 If you look at the chart, you can see more Americans could read at the 10th grade level in 1949 than could read at the 6th grade level in 2003. Again, I can only assume things have gotten worse. How can I assume that? Do I care about any of this? Well, somewhat. On the one hand, it means I have a cognitive advantage over a large percentage of the population. On the other hand, I live among people I can’t assume will understand what I say or write. On the third hand, people don’t like it when they perceive you’re smarter than they are (read THIS — it’s written at a 9th-grade reading level). But, it’s the fourth hand that hits home (notice the correlation with the advent of the Internet) . . .
That’s not looking good for anyone wanting to make a living as an author. There’s an uptick which I think was the introduction of e-books, but they’ve leveled out and have even lost a bit of ground to audio books. 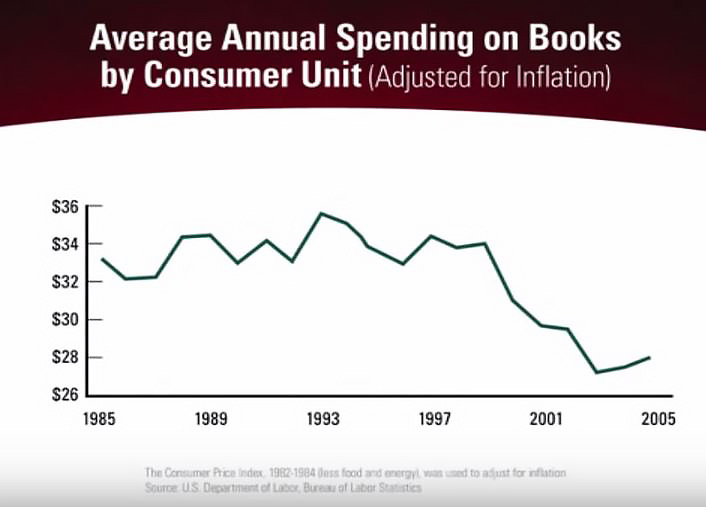 I don’t have exact numbers, but as Macris tells you in the video, each year sees 7% fewer adults reading books. Again, I don’t know if that number is adjusted for the increase in audio books. Note: I don’t know how others feel about it, but I cannot maintain the required concentration when listening to audio books (I’m not the only one). Unlike when I’m reading a book, my mind tends to wander and I miss stuff. People tell me they listen to audio books while doing other stuff. Since I know there’s no such thing as multitasking, that doesn’t make sense to me. Then again, I can only speak for myself. Macris stressed we should read “above our grade.” He likens it to exercise: if you want your muscles to grow and become stronger, you exercise with heavier weights. If you want to improve, read beyond your capability; push yourself. I checked my writings and — on average — my casual posts come in at a 5th-grade reading level, my short stories come in at a 6th-grade reading level, my novels come in at an 8th-grade reading level, and my opinion pieces come in at around 9th-grade level.
. . . except for this post . . . this one comes in at not quite a 4th-grade reading level. If people want to check their writing, here are two readability tools: HERE and HERE. There are others, some available by paid subscription. This entry was posted in Opinions and Stuff, Writing Stuff and tagged literacy, reading, reading levels, writing. Bookmark the permalink. The short answer is “photos are not fundamental.” The longer answer is below. There’s one in there . . . but I should have skipped it altogether so that people only interested in photos could skip this post. Going forward, I’ll make sure to flag at the beginning any posts that contain no photos. An interesting post, Disperser! I did not know that these readability test tools were available on the internet. I ran the first paragraph of my latest posting through a couple of your test tools and discovered that my text can be easily read by 18-19 year olds with a grade level of 15.3. Another analyzer gave me a much higher reading ease score with a much lower grade level of 9.7! Now I will have to study what some of the other scores and indexes mean. Some of the numbers I give are from yet another site that takes all the tests and aggregates them into a score. One of the two links in the post is a site with a brief explanation of the various readability tests. The one most people use is based on word, sentence, and paragraph length. There are others based on the frequency and number of the top 8,000 or so most easily understood words for each reading level. 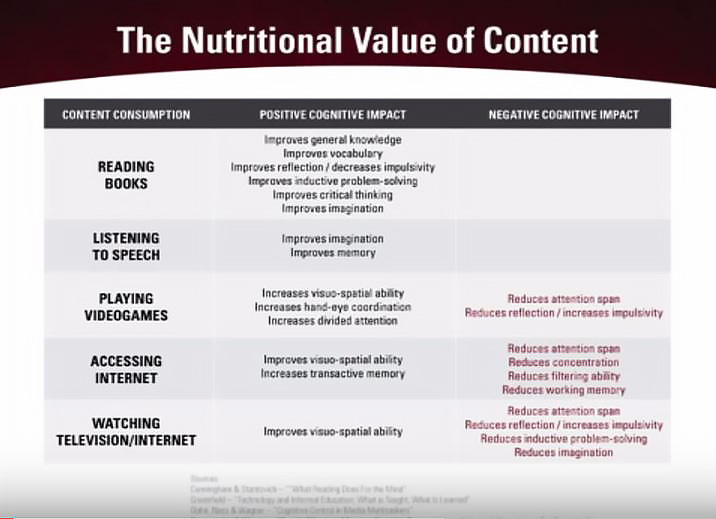 Some try to adjust for content and intent (casual reading versus an academic essay. As long as I know the metric, I usually pick one and use it as a comparative metric between different kinds of writing. My aim is not so much to nail a particular number but rather spot changes in my writing depending on whether it’s fiction or humor or opinions. My overall aim is to write at about an 8th-grade level (plus +/-1.5) as far as legibility goes even when discussing concepts and ideas that go beyond that. One other comment: the longer the sample, the likelier you’re getting a more representative score. I’ve analyzed stuff as long as 20K words and it’s pretty quick. I watched the original vid! Excellent! Important info on the vid and in your post! Thank you for sharing all of this, Emilio! All of this is fascinating to me for several reasons…1. I taught Kindergarten for years and taught 4 and 5 year olds to read. 2. My older siblings tell me I started to read on my own at age 3 and devoured any book I could get my hands on from then on. 3. I taught my own kids to read and they were reading well (above their age level) by the age of four. 4. I read and graded a lot of research papers for a college prof and was saddened and shocked by the reading and writing level/abilities (or lack of those abilities) by 18 – 21 year olds. My youngest kid got me a Kindle years ago. But, I still read book-books most often. I can’t listen to audio-books unless I am sitting still and just listening. If I try to do something else at the same time, I miss stuff. Thank you, diem3, and you are welcome. my mother tells me I was reading around 3 (a popular age to start reading, it used to be . . . on the other hand, I knew nothing of iPads, and iPhones, and other iStuff). Obviously, I don’t remember, but I take her word for it. Funny thing, I was planning a post on my early reading (Italian books). We now own four Kindles and most of my reading (including what I write) is on one of them (they sync from one to the other, so that’s nice). Since we moved, I have very few books (one small box) and they are in storage. The only physical books I would buy are those with artwork or photos since they don’t translate well into electronic format. Cool pictures and graphs, too many words though! Only one photo and that’s probably one photo too many.
. . . and, if you’ve noticed anything in reading this blog, it’s never too many words. I was talking to the teenage sons of a visiting friend from Holland last night and I was pleasantly surprised that they had an interest in politics, amongst many other things. During the conversation they mentioned that the manifesto of a far right wing candidate in a recent election was only half a page long, as opposed to the small booklets produced by the more moderate and mainstream parties. The right wing candidate came second! I pointed them towards the TEDx so they could read hear for themselves the numbers that I couldn’t remember. A worrying trend. No one has a monopoly on short messages (Obama’s “Hope and Change”, Trump’s “Make America Great”) but it’s worrisome when people don’t bother to dig beyond the face of them. I can bet both of those had different meanings to different people and no one got exactly what they were voting for. I also bet few people read the whole of the platforms of the two parties. If one is Republican or Democrat, I challenge them to go through the respective platforms line item by line item and mark down not only if they agree or disagree, but also how those might be accomplished and what might be the consequences of accomplishing it. No one listens to the few that would dig deeply into the feasibility and consequences of policies. The slogan is all that eventually matters. Reading and art are my most favorite subjects/activities so . . . interesting reading and beautiful photos makes for a perfectly balanced post . . . as in when your narrative describes your photos. I do agree that perhaps it would be better not to insert in a post an irrelevant photo that distracts from the attention you gave a specific subject and, in turn, want your readers to focus on. 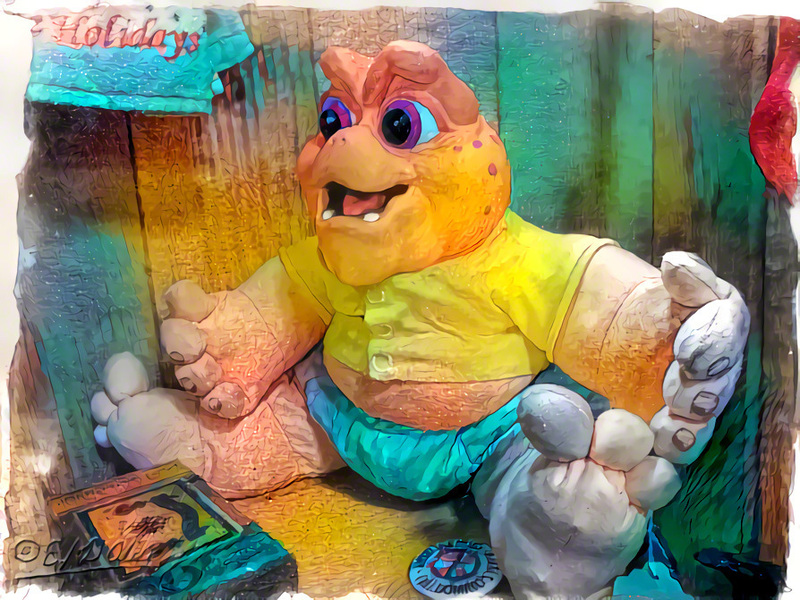 I had started inserting photos in opinion pieces as a way to break up the reading and give people who might not be interested in the opinions a reason to go through the post, but I think ultimately it detracts from both the photos and the writing. Interesting, very interesting. I often wondered why so many misunderstood simple sentences. I didn’t learn to read until school when one day the written word made sense. It was like flipping a switch. Math, on the other hand, I knew that. It’s very strange (awkward) realizing — when speaking to someone — that they might not know how to interpret instructions or understand written directions. One of the surprises with the decline of personal secretaries (late 70s and early 80s) was just how many people could not compose simple letters. I remember my days in GM when we started getting emails or even written memos directly from managers and being surprised (shocked) at the sloppiness in composition and word choices, let alone spelling errors. In that regard, I think today that a platform like Twitter helps mask people’s poor writing skills. That’s one of the reasons I’m against emojis . . . we’re going back to a time when we substituted pictorial symbols for the written word. I admit to liking emojis but your point is certainly valid. I was surprised when entering University how poor my writing actually was. However, I did learn to write reasonably well and helped write and edit catalogs for my last employer. While doing so, I also learned to write at what must be an 8th grade level. It was certainly different from my university days. It was also more effective, as you might imagine. I found the information on sentence and paragraph length illuminating as well. It’s what I’ve been trying to tell you the past few years, but you wouldn’t listen or believe me. Everyone knows Africa is in Paris and Europe’s in London. And the Sydney Opera House is in Peking sometimes called Beijing! I just met an Australian who thought Australia (the island) was actually a continent! Go figure. There are some strange people in this world, I tell you. ElBob . . . how long have you been reading my blog? I ask because it occasionally seems as if you don’t know me at all. the December post on fiction. One thing I’ve noticed since the election: I si can easily spend an hour reading news on my phone. Before the election I never read news on my phone. Read news holding a real paper in my hands. I’m really glad you’re submitting stuff. Hey, Giselle. Long time no hear. Hope all is well with you and hope your writing is progressing nicely. As for news, I’m trying to wean myself from the instant news cycle. I’m opting to wait a few days and then read more measured responses to whatever is going on. I’ve noticed that when I do that, it doesn’t seem as if the world is in a constant state of exploding. I’m also forcing myself to avoid writing my usual opinion pieces (or, at least, cut the frequency of them). Ultimately, my voice is not ever going to reach anyone of importance and even if it did, it’s not like they’ll listen, let alone agree, with what I have to say. I’ll vote and look at local and national issues, but I’m working to avoid the constant state of stress of this past year. As for submissions, I just finished editing my action/mystery novel. I figure I’ll let it rest for a month, give it another look-see, and then send it out to a few agents. I’m still submitting short stories, but I’m not very optimistic; I just don’t see the type of stories I write published anywhere. Anyway, I hope you’re also submitting stuff. Let me know how you’re doing both with writing and other things.